ABOUT NOAG INTERIORS NOAG Interiors is an online-only auction offering fine and decorative art, furniture, carpets, lighting, mirrors and more. Leave advance bids or bid live during the sale on our partner bidding sites, liveauctioneers and invaluable. Absentee bidding is available on our website prior to the auction. CONDITION REQUESTS Condition reports are posted daily as requested on our website and on our partner bidding sites, LiveAuctioneers and Invaluable. If you would like to request extra photos or a detailed report be emailed to you directly, you can contact us at info@neworleansauction.com, or click “INQUIRY” on the lot detail page, fill out the necessary fields and click “SEND INQUIRY”. We will respond to requests on a first come, first served basis. BIDDING Visit www.neworleansauction.com to create an account. Make sure that you are logged in and your registration has been approved. From the homepage, click “View Catalogue” to browse the current sale. You can also browse or search the catalogue from the “Auctions” tab under “Auction Schedule” or “Catalogue Search”. Scroll through the catalogue. When you see an item that you would like to bid on, click “BID & TRACK”. ABSENTEE BIDDING If you would like to submit an absentee bid, click “BID & TRACK” on the desired lot. Fill in the amount in the “Enter Your Bid” field. Please note that any special symbols or characters will not be accepted. Click “I agree to the Terms & Conditions. Place my bid” to submit your bid. You will receive a confirmation email once we process your bid(s). Click “Back” to continue bidding. Note that telephone bidding is not available for this sale. BID LIVE ONLINE Live online bidding is available via LiveAuctioneers and Invaluable. 29 Lenard Kester (American/California, 1917-1997) “Clown Holding Balloons” oil on canvas signed lower right. Framed. 20” x 16-1/4”, framed 27” x 23” $400-$700 30 G. Patrick Riley (American/Oklahoma, 20th Century) “Body Meditation #2”, 1971 assemblage of bamboo, wire, armadillo carapace, leather and ginger root h. 120”, w. 68” Provenance: Deaccessioned property of a Southern institution. 35 Four-High Mahogany Stacking Bookcase ca. 1900, by Macey. h. 63”, w. 34”, d. 12” $400-$700 36 American Colonial Revival Brass, Iron and Steel Fireplace Set ca. 1900, the set including a pair of andirons, h. 23-1/2”, w. 9-1/2”, d. 24”, a pierced fender, h. 11-1/2”, w. 62-1/4”, d. 10”, and three fire tools, l. 30” to 38”. Provenance: Estate of Margaret “Pat” Breen, Houston, Texas. early 20th century, possibly Native American, one in gray and cream with a central medallion, l. 78”, w. 62”, and the other finely woven in multicolored stripes, l. 93”, w. 84”. mid-20th century, English, comprised of twelve dinner plates, dia. 12”, eight salad/dessert plates, dia. 8”, two soup bowls, dia. 8”, six bread-and-butter plates, dia. 6”, six teacups, h. 2-1/4”, and nine saucers, dia. 6”. ca. 1891-1920, all with hand-painted, identified scenes on a cobalt ground richly decorated with giltwork, including four cabinet plates with T. Goode & Co., London retailer’s marks, dia. 8”, a three-handled goblet, h. 9”, d. 5-3/4”, a covered urn with ram’s-head handles, h. 10-1/4”, w. 5-1/4”, d. 4”, a similar smaller urn, h. 7-1/4”, w. 4”, d. 3”, and an urn with lion’s-head handles, h. 7”, w. 4-1/4”, d. 3”. late 18th/early 19th century, including a mahogany example with a pierced splat and scrolled knuckle grip, h. 38”, w. 28”, d. 21”, and a similar oak example, h. 38”, w. 26”, d. 20”. oil on panel signed “A. Pether” lower left. Framed and with artist plaque. 12” x 20”, framed 18” x 25” Provenance: Estate of Audry and Sherwood Bailey, Sr., Pass Christian, Mississippi. $600-$900 125 After Thomas Brooks (British, 1818-1891) Rescue on Rough Seas, “Departure” and “Return”, 1871 pair of engravings published by B. Brooks and Sons, London. Matted, glazed and framed. sight 21” x 36-1/2”, framed 34-3/4” x 50” Provenance: By repute, Estate of Fritz Bultman. 188 Three Gilt-Bronze Objects Cast by Ferdinand Barbedienne, Paris fourth quarter 19th century, the collection comprised of a pair of Baroque-style molded candlesticks, signed on the lower edge, h. 9-1/2”, dia. 4-3/4”, and a table figure of Cupid, readying his bow to shoot, signed on the lower rear, h. 10”, w. 3-3/4”, d. 2-1/2”. 212 Louis XVI-Style Giltwood Settee and Pillow early 20th century, the settee with a floral-carved crest, fluted legs and tapestry-style upholstery. h. 39”, w. 52”, d. 21” Provenance: Estate of Margaret “Pat” Breen, Houston, Texas. pair of pendant patinated bronzes third or fourth quarter 19th century, cast by AugusteMaximilien Delafontaine (French, 1813-1892), each with cast signature and foundry inscription on self-base, marked “AD” along edge of base. h. 17”, w. 6” to 6-1/2”, d. 5” Provenance: Private collection, Connecticut. Notes: Duret was an academically trained sculptor whose most popular and familiar works reveal his deep love and appreciation for the antiquities of the Classical Age. The son of an artist, he trained with his father and studied under Francois-Joseph Bosio, before traveling to Europe where he soon immersed himself in the history, culture and artistic traditions of the region. The original models for the works presented here (part of his debut exhibition at the Paris Salon of 1838), bear a resemblance in form and composition to the Dancing Satyr, a 1st/2nd century CE Roman sculpture (itself a copy of the 2nd century Hellenistic work), now conserved at the Uffizi Gallery, Rome, and the Dancing Faun, a 2nd century BC Greco-Roman sculpture, now conserved at the National Archaeological Museum in Naples. Duret’s figures, however, exhibit more freedom from the somewhat controlled postures of his inspiration; his dancers turn, twist and contort, revealing exuberant expressions and easily conveying to the viewers their pleasure and enthusiasm for the dance in which they are so completely engrossed. including six carved wooden African figures, h. 15-1/2” to 8-1/2”, a stool carved with a human head on an animal, h. 14-1/4”, dia. 12-3/4”, and a Central American pottery figure, h. 8-3/4”, w. 3-1/2”. Conditions of Sale: ALL SALES ARE “AS IS, WHERE IS” WITHOUT ANY WARRANTIES WHATSOEVER. PLEASE SEE SECTION 2(a) BELOW IN WHICH ANY AND ALL EXPRESS AND IMPLIED WARRANTIES (INCLUDING WITHOUT LIMITATION ANY WARRANTY AGAINST REDHIBITORY DEFECTS) ARE WAIVED. 1. Introduction (a). These Conditions of Sale (“Conditions of Sale”) contain all the terms governing Auctions (defined below) conducted by Cakebread Art Antiques Collectables, Inc. d/b/a New Orleans Auction Galleries (“NOAG”), and all the terms under which NOAG and the Seller (defined below) of a Lot (defined below) contract with the Buyer (defined below). These Conditions of Sale may be amended by posted notices or oral announcements made during the Auction. (b). Under these Conditions of Sale, the following capitalized terms are defined as follows: • An “Auction” is a public auction conducted by NOAG, at which Bidders may place Bids to purchase one or more Lots offered for sale by NOAG. An Auction takes place over one or more days and includes separate auctions of one or more Lots within an event conducted by NOAG; • The “Auctioneer” is the auctioneer calling the Auction conducted by NOAG; A “Bid” is a bid made by a party at the Auction to purchase a Lot; • A “Bidder” is (i) a person making a Bid at the Auction (whether in person, through an absentee bid, through electronic or internet means, or through telephone bidding); and/or (ii) a person who attends the Auction and registers to make a Bid (whether in person, through an absentee bid, through electronic or internet means, or through telephone bidding); • A “Buyer” is the party that commits to purchase a Lot by submitting the Winning Bid at Auction; • “Buyer’s Premium” is defined in Section 4 below; • “Catalogue” is the Auction catalogue utilized by NOAG to list the Lots offered at Auction; • The “Estimates” are the high and low estimates of value for each Lot set forth in the Catalogue presented by NOAG in connection with the Auction or otherwise set forth and/or announced at the Auction; • The “Hammer Price” for a Lot is the amount of the Winning Bid at the Auction, as announced by the Auctioneer, exclusive of commissions, Buyer’s Premium, expenses, and any taxes or other charges; • A “Lot” is specific item of property offered for sale at Auction; The “Reserve” is defined in Section 3 below; • The “Purchase Price” is defined in Section 4 below; A “Sale” of a Lot occurs when a Winning Bid is declared at Auction for the Lot; • The “Seller” of a Lot is the party who consigned the Lot with NOAG for purposes of selling the Lot, or is otherwise the seller of the Lot; • The “Winning Bid” is, as to a particular Lot, the Bid recognized by the Auctioneer as the highest and best Bid for that Lot. (c). Except as otherwise stated, NOAG acts as consignment agent for the Seller. The contract for the sale of the Lot is therefore made between the Seller and the Buyer. (d). By bidding at the Auction as a Bidder or Buyer, and/or by your signature below, you agree to be bound by these terms. (c). 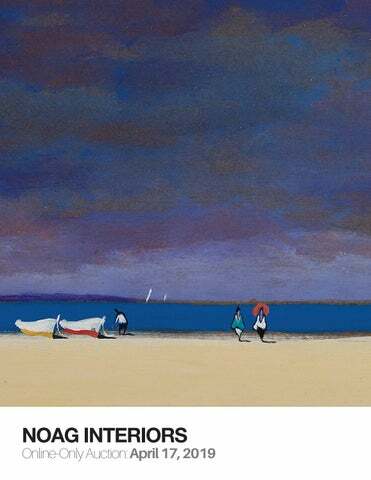 Catalogue and other descriptions. (i) All statements made by NOAG as to condition, authorship, period, culture, source, origin, measurement, quality, rarity, provenance, importance, or historical relevance, whether in the Catalogue entry for the Lot, in the Condition Report, and/ or in a bill of sale, or made orally or in writing elsewhere, are qualified statements of opinion only and are not to be relied on as statements of fact. Such statements do not constitute a representation, warranty or assumption of liability by NOAG of any kind. References in the Catalogue entry or the Condition Report to damage or restoration are for guidance only and should be evaluated by personal inspection by the Bidder or a knowledgeable representative. The absence of such a reference does not imply that an item is free from defects or restoration, nor does a reference to particular defects imply the absence of any others. (ii) Without limiting the foregoing, none of the Seller, NOAG, or any of NOAG’s officers, employees or agents, are responsible for the correctness of any statement of whatever kind concerning any Lot, whether written or oral, nor for any other errors or omissions in description or for any faults or defects in any Lot. (iii) Any Estimates provided should not be relied on as a statement that this is the price at which the item will sell or its value for any other purpose. Any written or oral appraisal, Estimate or other statement of NOAG or our representatives with respect to the estimated or expected selling price of any Lot of Property is a statement of opinion only and shall not be relied upon by Bidders or prospective Bidders as a prediction or guarantee of the actual selling price. (iv) NOAG shall not be liable for any errors or omissions in catalogue or other descriptions of the Property. Neither NOAG nor the Seller is responsible in any way for errors and omissions in the catalogue, or any supplemental material. (d). Further acknowledgement. As a Bidder and prospective Buyer, you further agree and acknowledge that: (i) You are not relying on NOAG’s skill or judgment in selecting to purchase any Lot; (ii) No oral or written statements in the Auction Catalogue, Condition Report, or elsewhere are the cause of or reason behind your purchase of any Lot; and you would have incurred such purchase regardless of any oral or written statements about condition, attribution, kind, quality, value, or authorship made in the catalogue or elsewhere; (iii) NOAG did not and could not have known that condition, attribution, kind, quality, expressed value, or authorship is the cause or reason why you decide to purchase any Lot; (iv) Your purchase of any Lot is not intended to gratify a nonpecuniary interest; and (v) NOAG did not know, nor should it have known, that any oral or written statement about a Lot in the catalogue, Condition Report or elsewhere would cause a nonpecuniary loss to a Buyer. 3. At the Auction (a). Registration before bidding / Bidding requirements. In order to be accepted as a Bidder and allowed to place a Bid, all Bidders must meet all of the following requirements: (i) A Bidder must complete and sign the attached registration form and provide identification to NOAG; (ii) NOAG may require the production of bank or other financial references or any other additional information; (iii) When making a Bid, a Bidder is accepting personal liability to pay the Purchase Price in full in the event that the Bidder submits the Winning Bid, unless it has been explicitly agreed in writing with NOAG before the auction of the Lot that the Bidder is acting as agent on behalf of an identified third party acceptable to NOAG, and that NOAG will only look to that principal for payment (iv) All Bids are to be made in U.S. currency unless agreed upon between NOAG and the Bidder; and (v) At NOAG’s sole discretion, NOAG may require any Bidder to post a cash deposit in an amount set by NOAG at its sole discretion. Such deposit may include, without limitation, a deposit of 25% of the Maximum Bid (or another amount set in NOAG’s sole discretion) in the case of Absentee Bids (defined below). (b). Refusal of admission / Rejection of Bidders. NOAG has the right, at its complete discretion, to refuse admission to the premises or participation in any Auction. NOAG reserves the right to reject any Bidder for any reason whatsoever and in NOAG’s sole discretion. (c). Absentee bids / Telephone bids. (i) As a convenience to Bidders, NOAG may allow a Bidder to submit an absentee bid (“Absentee Bid”) or telephone bid (“Telephone Bid”) by filling out (in full) the section of the attached registration form marked “Absentee Bids / Telephone Bids.” In order to submit an Absentee Bid or Telephone Bid for an Auction, that registration form must be filled out and submitted to NOAG no later than 5:00 p.m. central time on the last business day before the commencement of the Auction. (NOAG reserves the right to accept late Absentee Bid or Telephone Bid submissions in NOAG’s sole discretion.) All Absentee Bid submissions must include a maximum bid amount (“Maximum Bid”). (ii) If an Absentee Bid is submitted and accepted, at the time of the auction of the affected Lot, the Auctioneer or other NOAG staff will place the Absentee Bid at the amount of the opening bid amount, and will increase the amount as necessary until the earlier of (x) the Absentee Bid is the Winning Bid; or (y) the amount reaches the Maximum Bid. All such actions in this paragraph are at the sole discretion of the Auctioneer and/ or NOAG. If NOAG receives Absentee Bids on a particular Lot with identical Maximum Bid amounts, and at the Auction these are the highest bids on the Lot, the Lot will be sold to the person whose Absentee Bid was received and accepted first. In the event of a tie bid between an Absentee Bid and a Bid submitted by a Bidder physically present at the Auction (or a Telephone Bid), the Lot will be sold to physically present Bidder (or bidder submitting the Telephone Bid). (iii) If a Telephone Bid is submitted and accepted, at the time of the auction of the affected Lot, NOAG staff shall attempt to contact the Bidder using the telephone number provided. If successfully contacted, the Bidder shall then be afforded the opportunity to place a Bid on the Lot by telephone. Telephone Bids may be recorded. By submitting a Telephone Bid, the Bidder consents to the recording of the conversation and the placing of the Bid. (iv) Execution of Absentee Bids and Telephone Bids is a free service undertaken subject to other commitments at the time of the Auction and neither NOAG nor the Auctioneer shall have any liability for failing to execute an Absentee Bid or Telephone Bid or for errors and omissions in connection therewith. (d). Video or digital images. At some Auctions there may be a video or digital screen. Errors may occur in its operation and in the quality of the image and we do not accept liability for such errors. NOAG reserves the right to video tape and record proceedings at any Auctions. Any personal information obtained will be held in confidence by NOAG but may be used or shared with our affiliates and marketing partners for customer analysis purposes and to help us to tailor our services to buyer requirements. Any Bidder attending an Auction in person who does not wish to be video-taped may make arrangements to make a Telephone Bid in accordance with Section 3(c) above. (e). Reserves. All Lots are offered subject to a reserve, which is the confidential minimum price below which the Lot will not be sold (the “Reserve”). The Reserve for a Lot will not exceed the low Estimate for that Lot. The Auctioneer may open the bidding on any Lot below the Reserve by placing a bid on behalf of the Seller. The Auctioneer may continue to bid on behalf of the Seller up to the amount of the Reserve, either by placing consecutive bids or by placing bids in response to other bidders. Notwithstanding the foregoing, a Lot may be sold at a Hammer Price below the Reserve, at the discretion of the Auctioneer and NOAG, in any manner consistent with the agreement between NOAG and the Seller. (f). No bidding by Seller. Under no circumstances shall Seller (as agent or principal), whether by itself or through its representatives, employees or agents (except as through the Auctioneer as set forth in Section 3(e) above), enter or cause to be entered a Bid on Seller’s Lot. (g). Auctioneer’s discretion. The Auctioneer has the right at his or her absolute and sole discretion to refuse any Bid, to advance the bidding in such a manner as he or she may decide, to withdraw or divide any Lot, to combine any two or more Lots, and in the event of any error or dispute, to determine the Winning Bid, to continue the bidding, to cancel the Sale or to reoffer and resell the Lot or item in dispute. If any dispute arises after the Sale, NOAG’s sale record is conclusive. Unless otherwise announced by the Auctioneer at the time of Sale, all Bids are per Lot as numbered in the Catalogue and no Lot shall be divided for Sale. NOAG and/or the Auctioneer may withdraw any Lot at any time before such Lot is offered at Auction, for any reason and in their sole and absolute discretion. (h). Successful bid and passing of risk. The Auctioneer shall have absolute discretion in determining the Winning Bid and the striking of the Auctioneer’s hammer marks the acceptance of the highest and best bid as the Winning Bid and the conclusion of a contract for sale between the Seller and the Buyer. Risk and responsibility for the Lot but not its title passes to the Buyer immediately upon announcement of the Winning Bid at the Auction. (i). Post-auction sale. In the event that there is no Winning Bid at Auction for a Lot, or the Lot is withdrawn from the Auction, or the Sale is cancelled for non-payment pursuant to Section 4(g) below, NOAG may sell the Lot at public or private sale at any time thereafter, in a manner consistent with the agreement between Seller and NOAG. (j). NOAG assumes no responsibility for failure to execute Bids for any reason whatsoever. If we resell the property under Section 4(g)(vi) above, the Buyer shall be liable for payment of any deficiency between the total amount originally due to us and the price obtained upon resale as well as for all costs, expenses, damages, legal fees and commissions and premiums of whatever kind associated with both sales or otherwise arising from the default. If we pay any amount to the Seller under paragraph (vii) above, the Buyer acknowledges that NOAG shall have all of the rights of the Seller, however arising, to pursue the Buyer for such amount. (h). Shipping and packing. All shipping, packing, and transportation of Lots from NOAG’s facilities is the responsibility of Buyer. 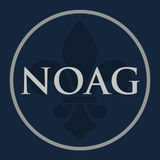 NOAG may, as a courtesy, assist Buyer with necessary arrangements, but by doing so, NOAG assumes no responsibility or liability for shipping, packing, moving, or transportation, including without limitation damage to Lots, damage to Buyer’s vehicle, or any personal injury of any persons involved. (i). Earlier payment may be required. For any specific Lot, and notwithstanding the provisions of Section 4(b) above, NOAG may require, in its sole discretion, that the Hammer Price for the Lot be paid immediately upon the striking of the Auctioneer’s hammer and announcement of the Winning Bid, with the balance of the Purchase Price being due by the close of the Auction. 5.Copyright The copyright in all images, illustrations and written material produced by or for NOAG relating to a Lot including without limitation the contents of the Catalogue, is and shall remain at all times the property of NOAG and shall not be used by the Buyer or Bidder, nor by anyone else, without our prior written consent. NOAG and the Seller make no representation or warranty that the Buyer of a Lot will acquire any copyright or other reproduction rights in it. 6. Severability If any part of these Conditions of Sale is found by any court to be invalid, illegal or unenforceable, that part shall be discounted and the rest of the conditions shall continue to be valid to the fullest extent permitted by law. 7. Data Collection In connection with the operation of our auction business, NOAG may need to seek personal information from Bidders or obtain information about Bidders from third parties (e.g., credit checks from banks). Such information will be processed and kept by us in confidence. Some of Bidders’ personal data may also need to be shared with third party service providers (e.g., shipping or storage companies) for Bidders’ benefit. By participating in an Auction, you agree to all previously stated disclosure. 8. Law and Jurisdiction The rights and obligations of the parties with respect to these Conditions of Sale, the conduct of the Auction and any matters connected with any of the foregoing shall be governed and interpreted under the laws of the State of Louisiana. By bidding at the Auction and/or through execution of the attached registration form, the Bidder consents to the exclusive jurisdiction of the courts of the State of Louisiana and the Federal courts of the United States of America located in the Eastern District of Louisiana. Telephones: Work (_____)_____________ Home (______)______________ Fax (______)_______________ E-mail Address: _________________________________________________________________________________ Conditions of Sale: Conditions of sale are as set forth in the applicable New Orleans Auction Galleries catalogue. Placing a telephone bid and/or absentee bid in the auction constitutes acceptance of all Conditions of Sale posted by NOAG as amended by any posted notices or oral announcements during the sale. $ $ $ $ $ $ $ $ $ VISA / MasterCard #: ____________________________________________ Expiration Date: _____________ CVV #: _______________ I have read and agree to the Conditions of Sale. I agree that a buyer’s premium will be charged on each lot purchased at 25% up to and including $200,000 plus 10% of the hammer price greater than $200,000. For purchases made by cash, check or wire transfer [subject to a $30 fee for domestic wires and a $60 fee for international wires], the buyer’s premium shall be discounted 3% of this 25%. Your signature on this form constitutes permission to charge successful bids to your credit card, including the 25% buyer’s premium, if payment is not received within five days of the auction.